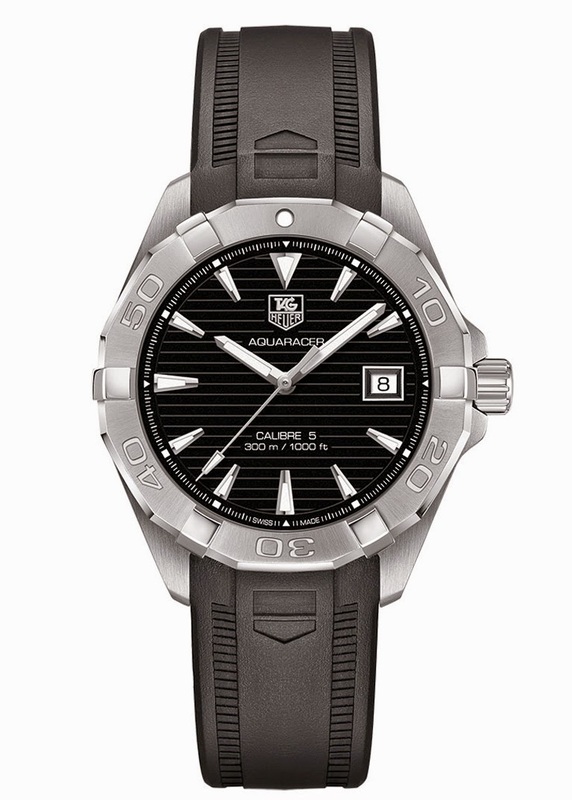 The Aquaracer is one of the most popular Tag Heuer watches. It was created in the early 1980s - originally introduced with the Tag Heuer 2000 name - and its design has always been characterised by the six studs on the bezel. 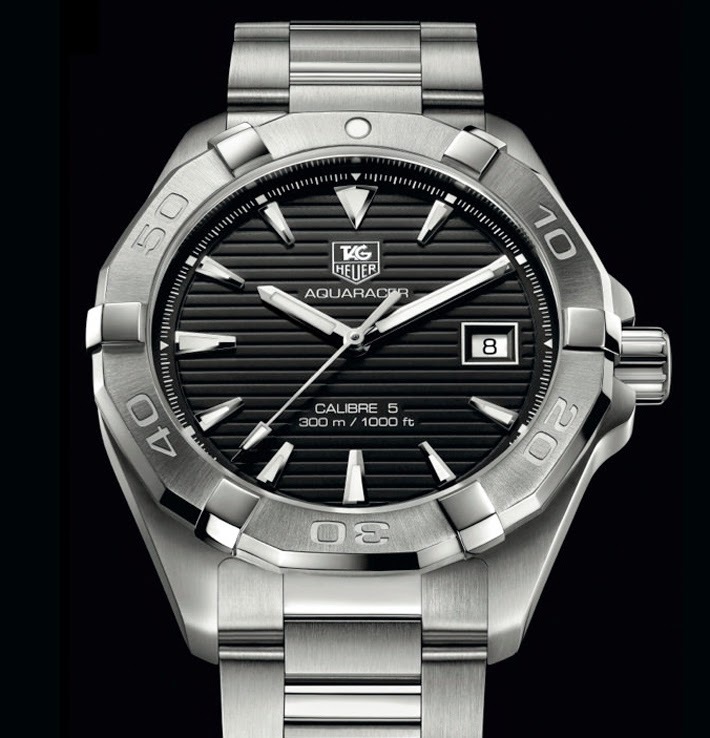 The latest evolution of the model is represented by the 2014 Tag Heuer Aquaracer 300m Calibre 5 40.5mm with new case, bezel and dial. The model is available with both quartz or mechanical movements. As usual, we focus on the mechanical version which houses the Calibre 5. The 40.5 mm steel case - water resistant to 300 metres - alternates polished and brushed surfaces. The unidirectional rotating bezel is now flat at the bottom rather than pointed and numbers are engraved and not black-lacquered. The watch is powered by the reliable Calibre 5 automatic movement, based on the Sellita SW200, which beats at 28,800 vibrations per hour and offers a power reserve of 38 hours. The dial of the Aquaracer 300m Calibre 5 models features a horizontal streak pattern with pretty thick hour and minutes hands and a sweeping seconds hand with a new triangle-shaped tip for improved visibility even with poor light conditions. Hands and hour markers, like the bezel dot at 12 o'clock, are treated with luminescent material. The dial is available in black (ref. WAY2110), silver (ref. WAY2111), blue (ref. WAY2112) or anthracite (ref. WAY2113). The blue and the silver dials are enhanced by a star burst finish. As an alternative to the H-link bracelet, it is possible to match the Aquaracer 300m Calibre 5 to a new rubber strap. Two steel/gold versions are also available, in yellow gold (ref. WAY2151) and rose gold (ref. WAY2150). In these models, the bezel features a solid gold insert while the hands and the hour markers are gold plated. The gold capped bracelet links have about ten times more gold than gold plated links (200 microns vs 20 microns). Retail prices for the steel version start from US$ 2,500. 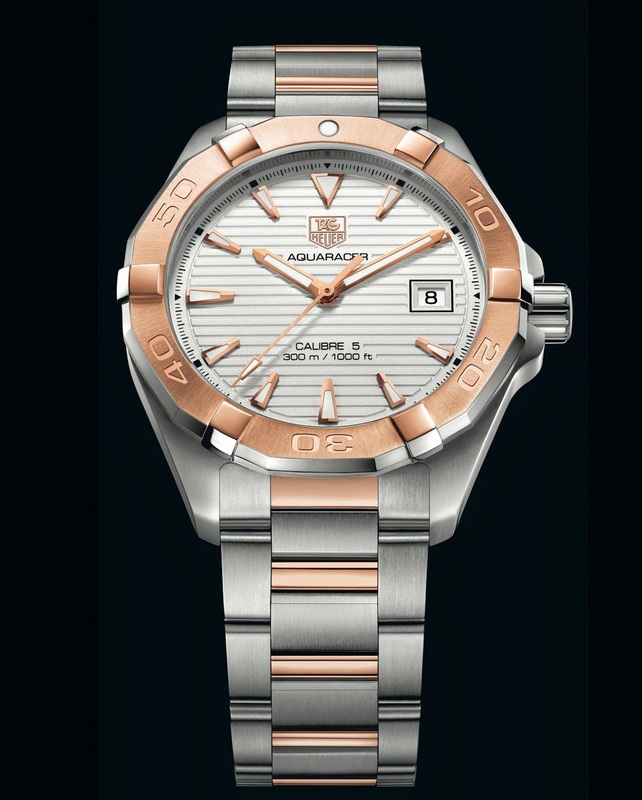 We wrote about the Aquaracer Lady 2014 here. 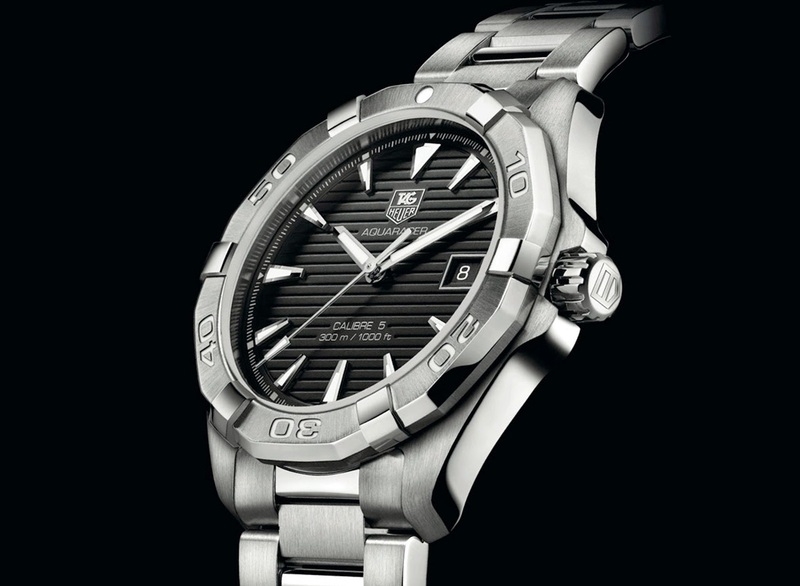 The Aquaracer is one of the most popular Tag Heuer watches. 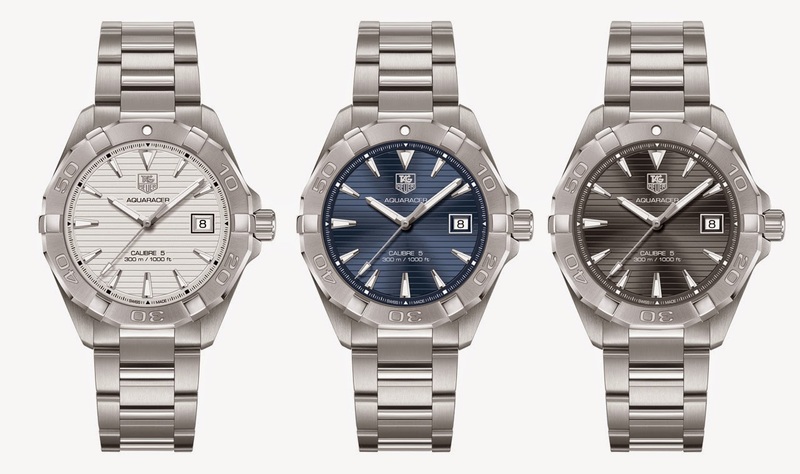 The latest evolution of the model is represented by the 2014 Tag Heuer Aquaracer 300m Calibre 5 40.5mm with new case, bezel and dial. The dial is available in black (ref. WAY2110), silver (ref. WAY2111), blue (ref. WAY2112) or anthracite (ref. WAY2113). The blue and the silver dials are enhanced by a star burst finish. Retail prices for the steel version start from US$ 2,500.